On the evening of Black Friday, Catalina Offshore Products resident fishmonger took to Facebook to put out notice that the company's delivery van was stolen from in front of a popular sushi mecca in San Diego's Pacific Beach. 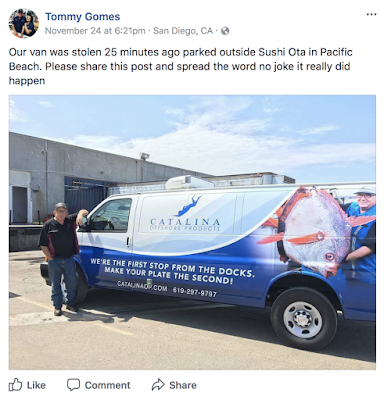 The Catalina Offshore Products van was taken from the retail plaza lot in front of Sushi Ota in Pacific Beach at around 6pm on Friday, November 24. The company's well-known fishmonger, Tommy Gomes, immediately took to Facebook to inform his friends to keep an eye out, and the post was shared over 1,000 times, including to the burgeoning Facebook Group Eating & Drinking in San Diego, which currently has over 12,000 local members. By Saturday morning, one member of EDSD commented on the thread that she had seen the van in her neighborhood. "I saw the van and posted that I saw it on the Facebook thread," explained EDSD member Kristina Botkin. "I didn't know there was only one van of the kind so sent the last 4 of the license plate. Then Tommy replied to that and I talked to him on messenger and let him know exactly where the van was." Upon being notified, Tommy Gomes went to Point Loma with his extra set of keys and the police met him there. The van was recovered on North Evergreen Street in Point Loma on Saturday, November 25 at around 8:45am, less than 15 hours from when it was stolen. Family-owned and operated by Dave Rudie since 1977, Catalina Offshore Products began exclusively as a sea urchin wholesaler. Over the last forty years, the company has built a strong reputation through providing customers with high quality and sushi grade seafood sourced mainly off the West Coast. Catalina Offshore Products is now one of the largest buyers of local seafood in San Diego and supplies some of the city's top restaurant with their product. There is no word yet on if any arrests were made connected to the theft, but cheers to the power of social media!